CSA stands for Community Supported Agriculture. Becoming a member of our CSA program is a great way to receive locally grown foods directly from our farm. By becoming a member of our CSA you will have the opportunity to receive a container of fresh picked produce available each week, tasty eggs, or on a monthly basis, poultry. We grow a wide variety of delicious produce. We use organic growing methods, no synthetic pesticides, insecticides or fertilizers. We farm sustainably using cover crops, crop rotation and natural methods to manage our crops. Our poultry are feed 100% natural feed are antibiotic free and are turned out each morning to spend their days at pasture. Becoming a member of Darby Meadow Farm CSA you will receive the freshest, most flavorful food grown just a few miles from your home! A CSA is both beneficial to both consumer & farmer. By becoming a member of our CSA you receive delicious food and our farm receives the benefit of a stable market. A CSA helps build community and unites people through food. 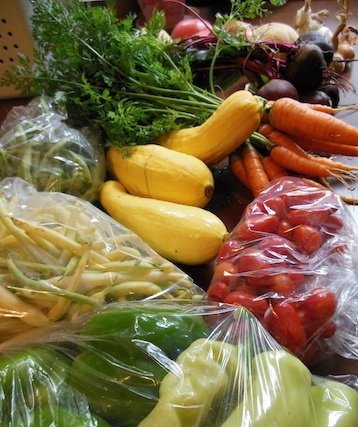 With a typical CSA you would become a member for the whole season (typically 20 weeks). At Darby Meadow Farm we offer a month by month membership. There are a limited number of memberships of our Produce, Egg, & Poultry Shares. Produce & Egg Shares are offered to purchase for the upcoming month the last week of the prior month. Priority for monthly membership will be given to current month members then on a first come first serve basis. Poultry shares are offered to purchase as well. To assure orders for poultry we ask that you place your order two months in advanced. Please send us an email if you are interested in becoming a CSA member of Darby Meadow Farm. Egg Membership shares AVAILABILE for 2019 season, email us for details. Poultry Membership shares AVAILABLE for 2019 season, email us to place an order. Produce Membership shares FULL for the 2019 season.